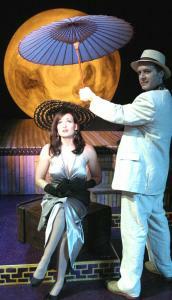 Aimee Doherty and Brendan McNab star in the musical "Adrift in Macao" at the Lyric Stage. "Adrift in Macao" is a sweet-and-sour Zombie of a musical, and I mean that in the nicest possible way. Like a postmodern ironic update of a "Polynesian" cocktail, this film-noir sendup puts all the original ingredients into a blender and serves them forth with a smirk. But, for better and worse, it still tastes funny. The musical, written by Christopher Durang and Peter Melnick in a pun-heavy, plot-light, relentlessly referential style that betrays their Ivy League wiseacre roots, got mixed reviews in its Off-Broadway run. If it fares better at the Lyric Stage Company, that's because the small scale and modest production values of Stephen Terrell's winking production work in its favor. To make silliness succeed, you have to keep it moving. That Terrell does, both in his snappy direction and in his amusingly parodic choreography. He and the small, nimble cast wisely gloss over the beyond-ridiculous plot: A femme fatale lands in Macao, immediately gets a job as a nightclub singer, finds herself entangled with a couple of brooding expatriates and a ridiculous co-worker or two, and everything from a gunfight to a familiar black bird from Malta makes it into the mix. Instead they focus on the groaningly dreadful puns, the deliriously cheesy musical numbers, and the general atmosphere of absurdist spoof. How bad are the puns? Well, the leading man - given an effortless scummy grace by Brendan McNab, a last-minute sub for the injured Paul Farwell - is named Rick Shaw. You know, so when the leading lady, Aimee Doherty's slinky-silly Lureena, screeches to summon a ride in 1952 Macao, she'll get a . . . Rick Shaw. They quickly exchange sultry glances and silly East-is-East cliches: "Never the twain shall meet," purrs Lureena; Rick asks, "What twain?" so she can answer, "The gwavy twain" - a line that even the script self-mockingly admits makes no sense at all. And then there's Rick's henchman Tempura - so named, as he mincingly explains, "because I have been battered by life." Boston Conservatory student Austin Ku delivers that line, along with a nonstop battery of exaggerated ethnic stereotypes, with an expert mix of knowingness and innocence. He's the funniest thing onstage, even before the big revelation near the end that takes the showbiz satire to a new level. Even so, for a 90-minute musical "Adrift in Macao" can feel awfully long, especially if you're not an undergraduate anymore. The kind of antics that charm in a brief sketch can pall when they stretch to feature length, as performers from Monty Python to the Blues Brothers have discovered to their sorrow. "Macao," in particular, has too many lines that just roll over and die, lying flat on the stage until a fresh bit of silliness pops up to sweep them aside. Melnick's snazzily parodic melodies help, but there's something clunky about a lot of Durang's writing here. Where the pacing should go "laugh, laugh, song, laugh," too often it's "laugh, song, clunk." Well, there are worse things on a snowy night. And certainly these performers - including the irresistible Kathy St. George as a sweetly ridiculous fading songbird - can make just about anything fun to watch, especially when they're given costumes as outrageously excessive as the satin slips and ruffled mambo sleeves supplied here by David Costa-Cabral. Don't expect any deep or lasting pleasures. Just sip your mai tai and relax. Directed and choreographed by: Stephen Terrell. Musical direction, Jonathan Goldberg. Set, J. Michael Griggs. Costumes, David Costa-Cabral. Lights, Scott Pinkney. Conductor, F. Wade Russo.